Serikjan Bilash makes a speech at the Ata-Jurt collective’s office. Screenshot from video shared by the group’s YouTube channel on February 2. Kazakhstan-based activist Serikjan Bilash has helped hundreds of Kazakhs advocate for their loved ones who are detained or missing in neighbouring China’s Xinjiang region, amid the Chinese government’s crackdown against ethnic and religious minorities. And ever since his dramatic arrest by Kazakh police on March 11, on suspicion of inciting “inter-ethnic hatred”, they have been returning the favour. For the past week, Kazakhs have been making videos to demand the release of Bilash, whose organisation has made the Central Asian country a focal point of international reporting on Beijing’s oppressive “re-education” drive in Xinjiang. A typical video with a corresponding translation is below. Dear (President) Nursultan Nazarbayev, all Kazakh people depend on you. There are Kazakhs suffering from unjustified repression in China. This situation has lasted for more than three years. At first, there were deep frustrations. But Serikjan taught us how to legally write our complaints. He also attracted more attention from the international community. In short, I’d like you to grant him freedom. Currently there are around 400 such videos supporting his release, many of which have been viewed over a thousand times. Most are addressed to Kazakhstan’s 78-year-old strongman President Nursultan Nazarbayev. Most of the reporting on Bilash’s March 11 arrest has focussed on China’s “long arm” and its potential to pressure a Central Asian neighbour that depends on it for trade and investment. Although Bilash was arrested and held by Kazakh authorities on March 11, he was put on house arrest the following day by a court in the capital Astana. There are good reasons to believe China has been embarrassed by Bilash and his informal organisation, known as Ata-Jurt. Ata-Jurt’s campaign, mostly focused on the ethnic Kazakh population of more than 1.5 million in Xinjiang, has done much to reveal the inner workings of the police state there. Ata-Jurt has encouraged both relatives who have loved ones missing or detained across the border in Xinjiang and people who experienced “re-education” there to speak out about their experiences. Gene Bunin, the curator of the English-language Xinjiang Victims Database estimates that Ata-Jurt has published at least 3,000 video testimonies produced by 2,000 different testifiers. Bilash’s interviews, in turn, have been featured in dozens of internationally recognized media outlets, all of which reported on his arrest. These reports created a storm of negative PR on a scale Kazakhstan could scarcely have anticipated. Preserving vital ties with China might be a powerful enough motive for authorities to move against Bilash. But Kazakhstan’s authoritarian regime had other reasons to view him as a threat. Bilash’s charismatic public speaking and media-savvy approach to community leadership have ensured him a growing following in the last year or so, particularly among Chinese-born, naturalised Kazakh citizens like himself. Such levels of support for an independent public figure represent a headache for a regime that is failing to tamp down growing dissatisfaction. These nerves are betrayed by the video above, which was filmed by police after Bilash’s arrest and has since been subtitled into English. 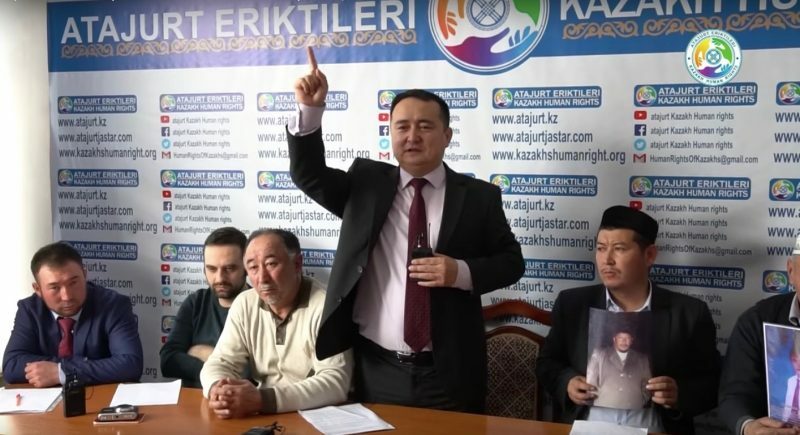 In the video, the activist implores fellow Oralman (ethnic Kazakhs who have been repatriated to the country) not to participate in rallies organised by Nazarbayev’s foreign-based political rival, the fugitive banker Mukhtar Ablyazov. Since the video was filmed, he has released another statement via voice message confirming that he was pressured by investigators into denouncing Ablyazov, and that he was also told to refuse the services of his preferred lawyer. Bilash felt uncomfortable denouncing Ablyazov, he said, because he did not know who Ablyazov was. He would be keeping his lawyer despite the pressure, he added. Bilash’s insistence that he is a one-issue activist without political ambitions makes it difficult for pro-government groups and media outlets to smear him. A Facebook account called “Enemies of the People 2.0″ that regularly attacks opposition figures was flooded with negative comments when it attempted a clumsy hit job on Bilash, likening him to Ablyazov. The incitement charges against Bilash relate to a speech he made at a gathering themed on Xinjiang last month, during which he called for a “jihad” against China and its policies in Xinjiang. During the speech Bilash made sure to clarify that by “Jihad”, he meant waging an information war, “not getting a gun and going to Syria.” But Kazakh state media cut the speech so that this clarification edited out of the footage aired on a evening news segment days after his arrest. If Bilash is charged and subsequently sentenced for these comments, he could spend between five and ten years in jail. But his release to house arrest in a country where the vast majority of political prisoners are held in pre-trial detention is already an indicator that authorities are unsure how to handle his case. Freeing him may look like an embarrassing retreat, not to mention an affront to China, but jailing him could be more costly still.